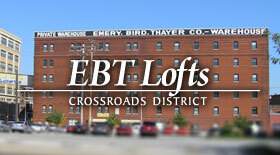 Crossroads Lofts bears the name of the district where it lives. Located right on the corner of 16th Street and Grand Boulevard, Crossroads Lofts is an ornate two story, buff brick, commercial building with large display windows and decorative guilloché and fret patterns. Unique and stunning one and two bedroom floor plans are available with floor to ceiling windows and concrete floors giving way to open layouts. This pet friendly building has Google Fiber and an onsite clothing care center along with secured access and courtesy patrol. Monthly rents start at around $950 for one bedrooms and gated parking is available for an additional fee. Crossroads Lofts was built in 1910 by the architectural firm Root & Siemens for the Mitchell Motor Company. The Mitchell Motor Company was known for building large, fashionable touring cars for the wealthy from 1903 to 1923, when the company folded. This commercial area flourished with the introduction of cable car and electric trolley lines, and a cable car line ran south from the River Market area along Grand Boulevard (formerly called Grand Avenue) all the way to 40th Street in the Midtown area of Kansas City. This building saw much of its surrounding structures erected in servitude to Kansas City’s commercial boom and successful inter-city public transportation of the first two decades of the twentieth century. 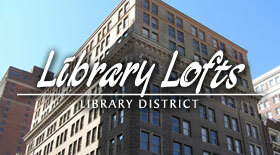 Being in the heart of the action, Crossroad Lofts conveniently sits close to numerous bars and restaurants. Just north on Grand Boulevard, live music venues and posh drinking establishments line up on either side while the popular Power and Light District and the Sprint Center are only a few blocks away. The remarkable Kauffman Center for Performing Arts is just to the West on 16th Street. Easy highway access is done on Grand Boulevard towards the Downtown Loop via I-670, which includes access to major interstates and freeways. Grand Boulevard operates as a Bus Rapid Transit corridor and streetcar stations along Main Street can be reached within a five minute walk. Grand Boulevard is also bicycle friendly with bike lanes from 20th to 3rd Street and B Cycle stations, a public bike share system, are dotted around much of Downtown. With its location and proximity to local destinations and transportation amenities, Crossroads Lofts makes city living more fun! 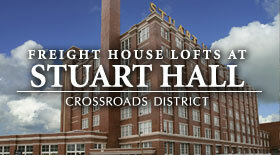 Have a piece of Kansas City’s dazzling past and bright future with Crossroads Lofts! Interior Design – Large windows with stained glass accents, polished concrete floors, open loft layouts. Security – Courtesy patrol, secured entry, digital telephone access for guests. Building Features – Historic facade, small building with big spaces, Google Fiber and onsite clothing care center. 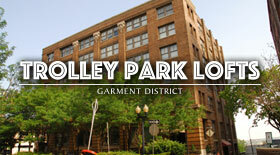 Location – 1600 Grand is just blocks from KC’s best restaurants, entertainment and the Streetcar. Parking – Gated parking available for rent. Pets – Pet friendly, restrictions apply. Rent Café – All KCLoftCentral communities are connected via Rent Café. This online resident portal allows tenants to pay rent, view their tenant ledger, schedule maintenance requests and view community messages.